We appreciate your feedback about your support experience with SkyVerge, developers of Postcode/Address Validation. This helps us maintain high standards on the WooMarketplace, and helps SkyVerge improve. Postcode / Address Validation will simplify your checkout process and improve order address quality by having your customer validate or lookup their address during checkout. Improve your bottom line and customer happiness with Address Validation! Postcode / Address Validation works by connecting your store to a service that provides address or postcode lookup. You can use Loqate, SmartyStreets, Postcode.nl, PostcodeSoftware.net, or Crafty Clicks. Address auto-complete is available with Loqate, which works for merchants in any country. With a paid Loqate account, your customers can auto-complete addresses in any country and addresses can be classified as “residential” or “commercial”. Merchants in any country can sign up for an Loqate account to get started. See Loqate + WooCommerce in action. U.S. address verification uses SmartyStreets, which lets customers look up or verify an address, or accept recommended adjustments as needed. 250 lookups per month are available for free, and additional lookups can be purchased. SmartyStreets can also classify addresses (residential or commercial) or geocode them. SmartyStreets is for U.S. merchants / U.S. address verification only. While SmartyStreets can provide international address validation services, our plugin does not support verification outside of the U.S. at this time. 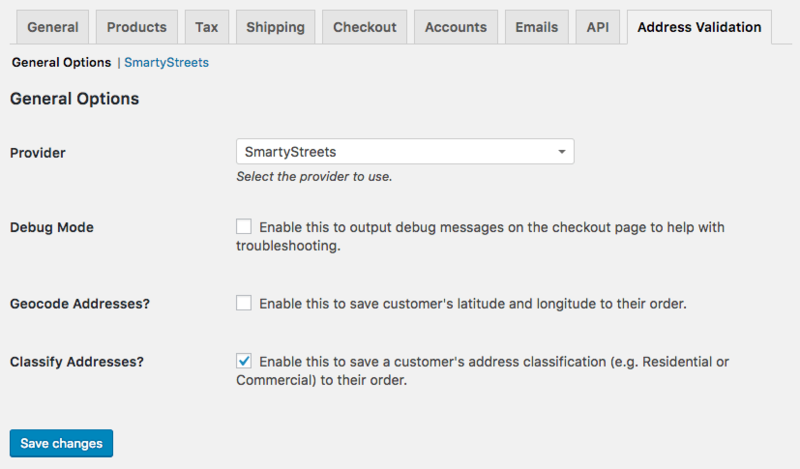 See SmartyStreets + WooCommerce in action. Address lookup by postcode is available for UK or NL addresses via one of the following providers: Postcode.NL, PostcodeSoftware.net, or Crafty Clicks. PostcodeSoftware.net and Crafty Clicks use data from Royal Mail to perform UK address lookups based on postcode, so you can be assured of address data accuracy. You’ll need a low-cost plan with any of these providers to perform UK postcode lookups. Merchants who’d like to offer postcode lookup in the Netherlands can use Postcode.NL to provide postcode lookup for Dutch addresses. See Postcode lookup + WooCommerce in action. Why else should I use Postcode / Address Validation? Stream-lining your shipping processes will only help your business since you easily avoid costly shipping mishaps. Both you and your customers will save time while ensuring that your shipping details are valid, and your checkout process will be simplified. Everybody wins! 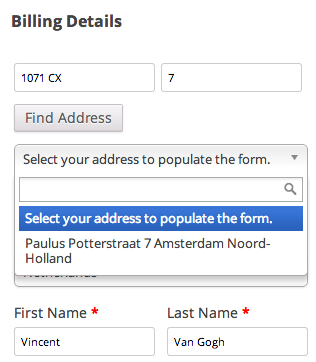 Postcode / Address Validation is also super easy to use, so you can immediately start improving your checkout experience. You can even streamline this even further by using One Page Checkout, as Postcode / Address Validation is fully compatible! 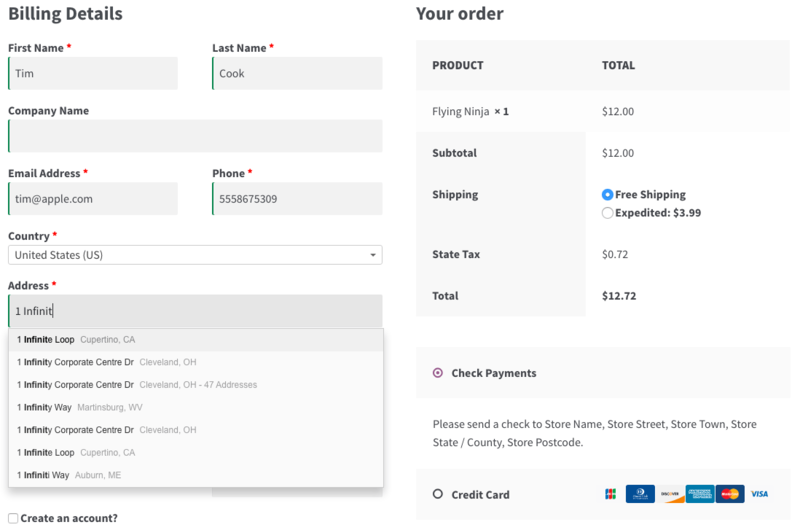 Lookup fields will be displayed within any One Page Checkout in your store as well as your regular checkout page. Sign up for Loqate (recommended – any country), SmartyStreets (U.S.), Postcode.nl (NL), Crafty Clicks (UK), or PostcodeSoftware.net (UK). That’s it! Sit back and enjoy improved shipping efficiency!